There may come a time when you need to send a report to another user, Acctivate company, or to your Acctivate support representative. In these cases, you can either send them the .rpt file, or you can use the export function. Both do the job of getting the data to your target, but by using the export function, the resulting file will contain all of the set selection prompts, report ID/Description, and other Acctivate specific settings. 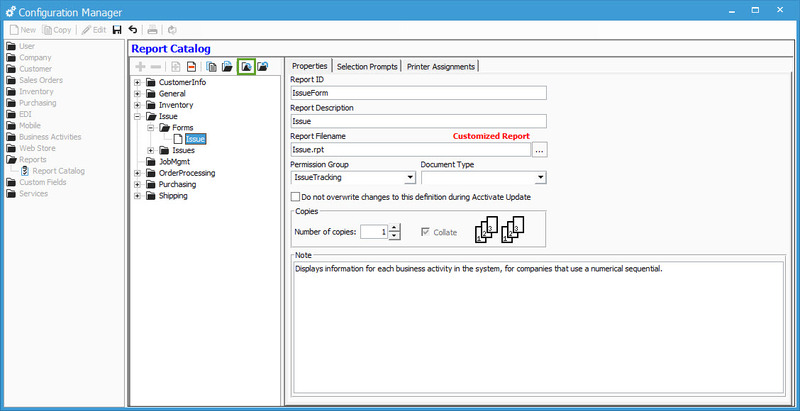 All you need to do to export your report is open configuration manager, select “Reports”, then locate the report you wish to export. Once located, click on the report and enable editing. In edit mode, click on the folder icon with an arrow coming out of the folder (highlighted by the green box blow). You’ll then see a window pop up where you can browse to where you’d like the file to be exported and/or rename the file. After setting this information, click the save button to finish exporting. Once the window closes, hit the save icon in configuration manager to exit editing mode.